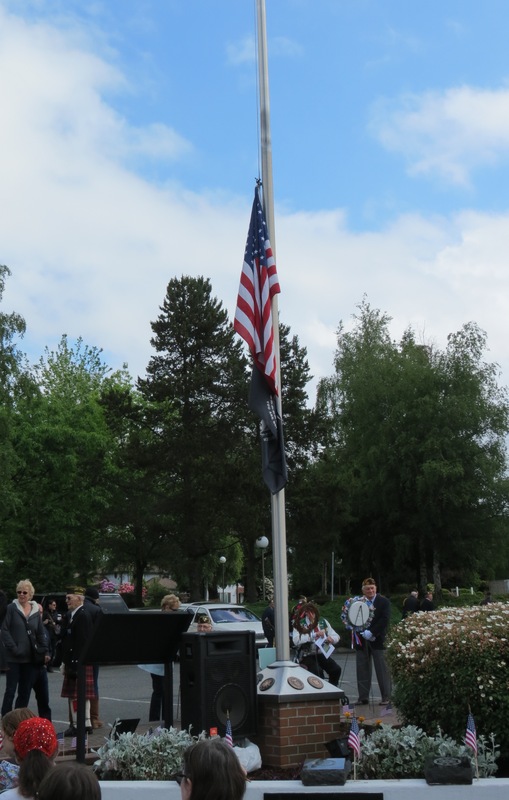 On 26 May, when we arrived at Veterans Park in downtown Lynnwood near the public library, the flag of the United States was at half mast. It remained there only until noon, when it was raised to full-staff for the remainder of the day. The symbolism of this is for us, the living, to remember and honor those who came before and sacrificed their all, while we resolve to continue the fight for libery and justice for all…that they shall not have died in vain. That’s part of America, the beautiful. 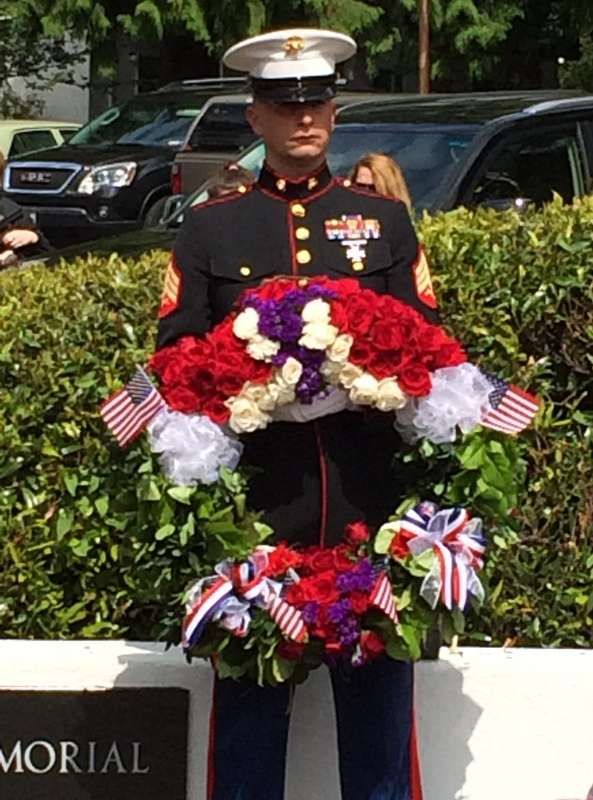 A special wreath was laid this year by Myra Rintamaki, a Gold Star mother, in honor of the fallen. Her son, Cpl. Stephen Rintamaki, US Marine Corps, was killed in action in Iraq on 16 September 2004. The Gold Star Mothers Club is comprised of such mothers. Its origin comes from World War I, which the USA entered in 1917. George Vaughn Seibold, 23, an American, flew British planes with the 148th U.S. Aero Squadron of the British Royal Flying Corps. That prompted his mother, Grace Darling Seibold, to do community service, visiting returning servicemen in hospitals in the Washington, D.C. area. Suddenly, his letters stopped, and on 11 October 1918, George’s wife in Chicago received a box marked, “Effects of deceased Officer 1st Lt. George Vaughn Seibold.” He’d been killed in action in an air battle on 26 August. His body was never identified. Grace organized a group of grieving mothers whose sons had lost their lives in military service. 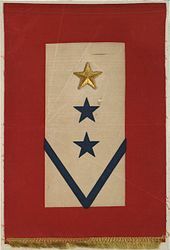 During that war, families of service members displayed a banner, known as a service flag, in a window of their homes. The banner is defined as a white field surrounded by a red border. A blue star on the white field represents each family member serving in the Armed Forces of the USA during time of war or hostilities. A gold star represents a family member who died during service, regardless of the cause. 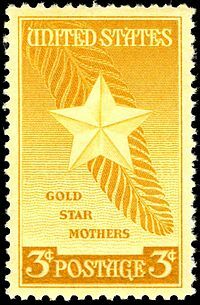 On 4 June 1928, twenty-five mothers established the national organization, American Gold Star Mothers, Inc. It continues to operate today, commonly known as the Gold Star Mothers Club. To learn more, please see http://www.goldstarmoms.com and http://www.goldstarmoms.com/Depts/WA_ID_OR_AK/WashChapt/WashChapt.htm. Photos by Nancy MacDonald. To enlarge a photo, simply click on it. Glenn Ledbetter, VFW Post 1040 Bugler, sounds “To the Color.” Photo by Carol Sheldon. 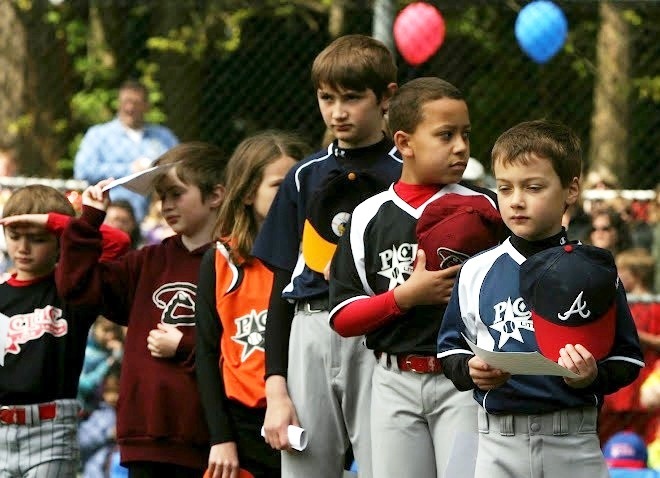 More than 20,000 boys and girls have played baseball and softball in the Pacific Little League since it was founded 48 years ago in 1965, and for the last two, I’ve had the privilege of sounding the bugle call, “To the Color,” on the annual PLL Day–this year on 27 April at Lynndale Park in Lynnwood. More than 800 boys and girls, ages 5-18, from Lynnnwood and Edmonds now participate. For more information about PLL and this annual event, please see www.pacificlittleleague.com and my post dated 22 May 2012, in this blog (archives, left column). Please click on any photo englarge it. Two were taken by Carol Sheldon (as marked), and Designer Portrait Studio took all the other photos (see www.thedesignerportraitstudio.com). 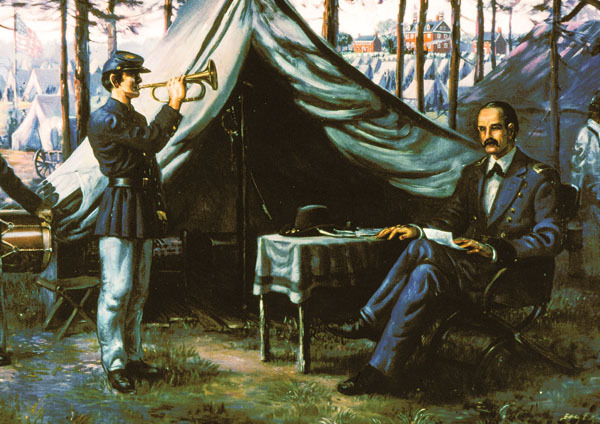 In 1862, when Daniel Adams Butterfield composed “Taps” during the Civil War, there was no Veterans Day. A New Yorker, he was then a Brigadier General and later a Major General in the Union Army. Fifty-six years later in 1918, this national holiday was established (first as Armistice Day) after the end of World War I. Its name was changed to Veterans Day after World War II and is now celebrated annually on 11 November in honor of all American veterans. This year is the 150th anniversary year of “Taps,” the most famous of all American bugle calls. 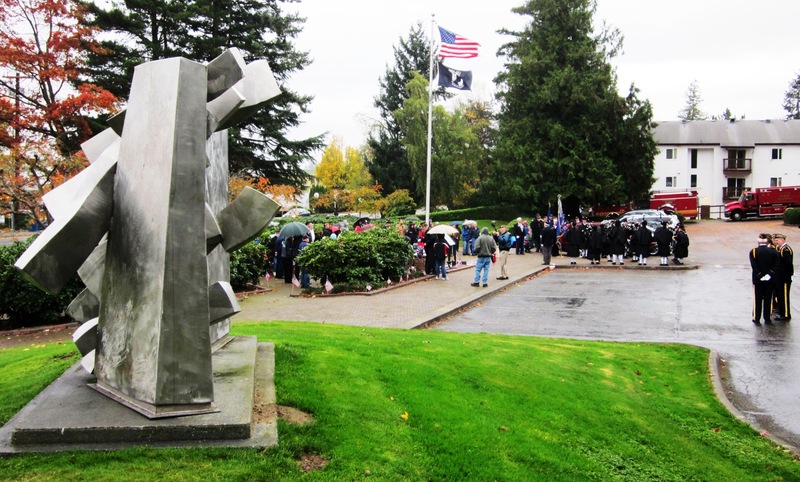 Thus, it came to pass that Richard Haydis and I sounded “Echo Taps” to close the memorial ceremony at Veterans Park in Lynnwood on a rainy Sunday, 11 November 2012. Ray Colby, VFW Post 1040 Piper and a U.S. Navy veteran. Cub Scout Pack 331 placed flags in the park and distributed the ceremony programs.During 2012, buglers throughout the nation participated in numerous ceremonies to commemorate the 150th anniversary of “Taps.” The prime event occurred on 22-24 June at Harrison Landing on the grounds of Berkeley Plantation along the James River, southeast of Richmond, Virginia (see www.taps150.org). 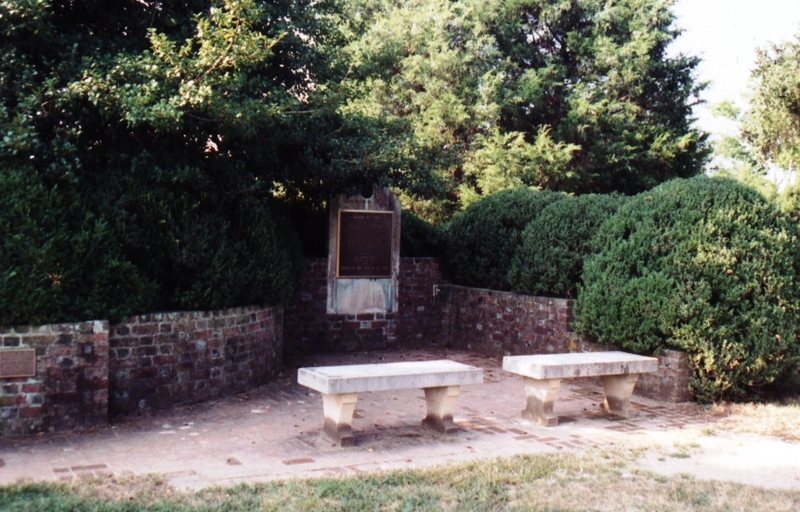 This was the birthplace of America’s Song of Remembrance. For a detailed account of the composition of “Taps”, please see “24 Notes That Tap Deep Emotions,” by Jari A. Villanueva, at www.west-point.org/taps/Taps.html. The Virginia Department of the American Legion erected a monument dedicated to “Taps” on a knoll where General Butterfield’s tent stood in July 1862. This is the only such monument in the country. There is a bronze statue of Butterfield in Sakura Park on Claremont Avenue in Manhattan, not far from Grant’s Tomb. And Butterfield is buried at West Point, although he attended Union College (Class of 1849) in Schenectady, not the U.S. Military Academy (see www.union.edu/news/stories/2012/05/sounding-a-solemn-note-taps-turns-150.php). Incidentally, the call is named “Taps” because at the end of the call, a drummer would play three distinct drum taps at four-count intervals. And as popular and beautiful as it is, “Echo Taps” is not an official bugle call of the U.S. military. Officially, “Taps” is to be sounded by a single bugle. Photos of the 2012 Lynnwood ceremony are by Andy Dingman. Please click on any image to enlarge it. 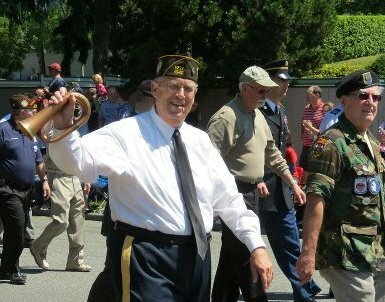 Glenn Ledbetter, Vietnam War Vet, Edmonds Independence Day Parade, 2012. The bugle was a gift from a retired Air Force pilot who purchased it in England. Imagine–it was Pacific Little League (PLL) Day on Saturday, 28 April, at Lynndale Park near Lynndale Elementary School. There were games, a fun Parade of Players onto Harry H. Moore Field, and a ceremony. The organizers honored the nation’s military during the ceremony by inviting all military personel (active, reserve, retired and veterans) to join the players on the field to honor and thank them for their service. “We want our players to understand how important these men and women are to us,” it said on the PLL website (see www.pacificlittleleague.com). Seventeen military personel came onto the field and stood along the 3rd base line. The color guard of VFW Post 1040 of Lynnwood hoisted the American flag on the center field pole, as the post bugler (me) sounded the bugle call, “To the Color.” Jaymie Studioso then sang the “Star Spangled Banner,” and Captain Barry Crane, USN, gave the opening prayer. Capt. Crane is Deputy Region Chaplain for Navy Region Northwest and North Sound Church lead Pastor. The color guard of three veterans then joined their 17 comrades on the field. Next, Capt. Crane assisted seven little league ball players in reading a tribute to military men and women written by Mike Schindler (see photos to left and below). Spider Avdeyev read, “Only one percent of Americans answers the call to serve our country [in the military].” Nick Avdeyev read that the U.S. military is comprised of paid volunteers. Presley Denkinger read a tribute to the Army, our oldest military branch, responsible for land-based military operations since 1775. Gabe Avdeyev read about the Navy, the battle fleet tonnage of which is greater than that of the next 13 largest navies combined. A statement about the Marine Corps, a Navy component which has served in every American armed conflict, was read by Jordan Sims. Then Baylor Denkinger read about the Air Force, the most recent military branch and the most technologically advanced air force in the world. Finally, Madi Sheldon read the tribute to the Coast Guard, our oldest continuous seagoing service, responsible for enforcing U.S. law in 3.4 million square miles of ocean. 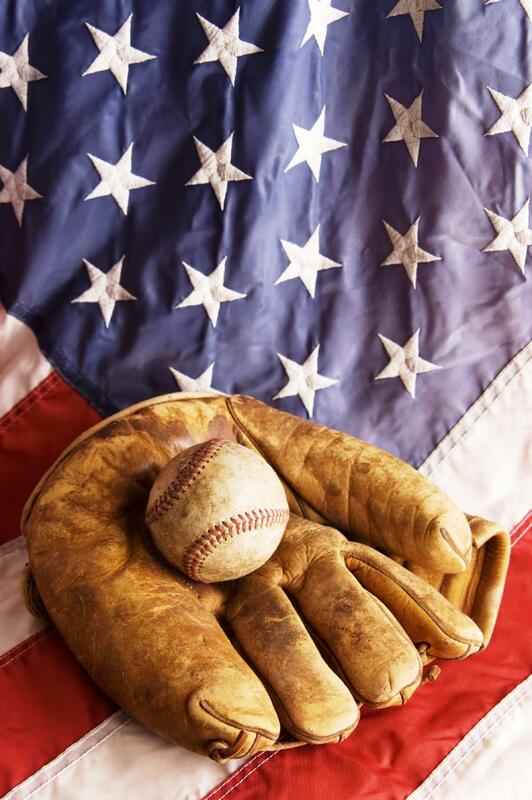 Founded in 1965, the Pacific Little League now involves more than 800 boys and girls between 5-18 years old playing baseball and softball. In the past 48 years, this volunteer-based organization has provided services to over 20,000 boys and girls in the greater Edmonds/Lynnwood area, impacting an estimated 10,000 families. The Echelbarger Fieldhouse was built in 2000 with more than $300,000 in donated funds. Lights were added to Fields 1 and 2 in 2001, and to Field 3 in 2005. Ventilation, gas grills and ovens were added to the fieldhouse kitchen in 2005. The Pacific Little League paid for all facilities by “Capital Improvement Fundraising.” No taxpayer dollars were used. 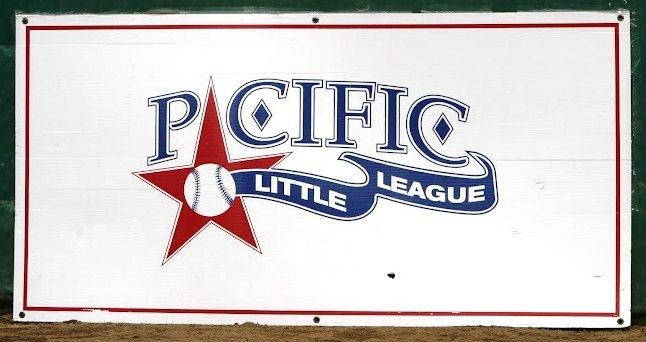 See www.pacificlittleleague.com for more information on the teams, divisions, tournaments, and game schedules. 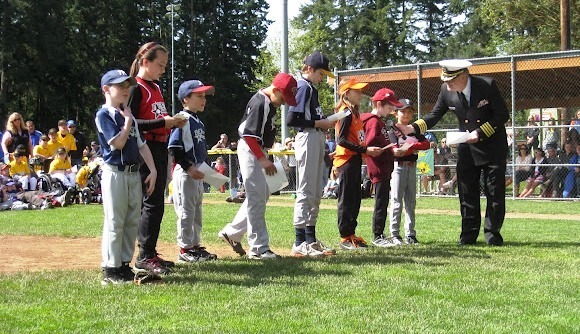 Photos are courtesy of the Pacific Little League. Please click on any photo to enlarge it. For one second on this special Veterans Day, the time was exactly 11:11:11 on 11-11-’11. A few minutes later, I sounded “Taps” for all our veterans, including me (Navy, Vietnam). Prior to the ceremony, Martin Spani, Commander of VFW Post 1040 of Lynnwood, had stationed me where the silver sculpture stands on a knoll in the Veterans Park in downtown, just south of the library. “After the NW Junior Pipe Band plays ‘Amazing Grace,'” he said, “the firing squad will fire three volleys. When they come to Present Arms, you play ‘Taps. '” And that’s just how it happened, probably very similar to many thousand other ceremonies this day across America, except for our pouring-down rain. Out of curiosity, I looked for the plaque that would tell me about the stainless steel sculpture where I stood to sound “Taps”—it’s untitled (1979) by Bruce West. 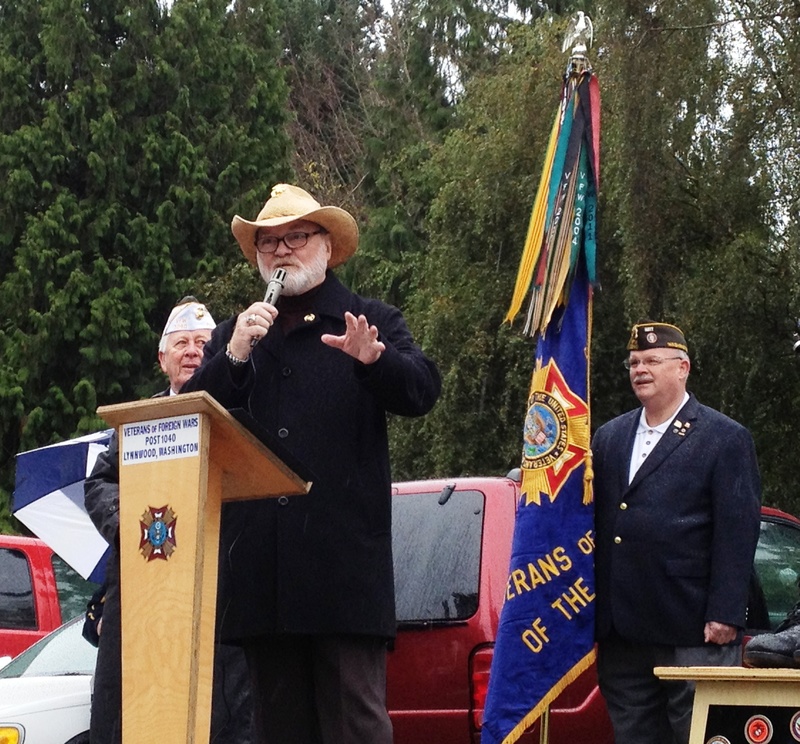 The guest speaker was Michael G. Reagan, Edmonds artist, who spoke about his foundation’s Fallen Heroes Project. “Our mission,” he says, “is to honor the American Fallen Heroes for their ultimate sacrifice during the war against terrorism. The foundation will provide the resources to produce and distribute to each family a hand-drawn portrait of their Fallen Hero, created by artist Michael G. Reagan, free of charge. 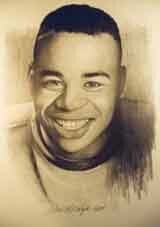 Each portrait is intended to show our Love and Respect for these Heroes and their families.” See http://www.fallenheroesproject.org/. 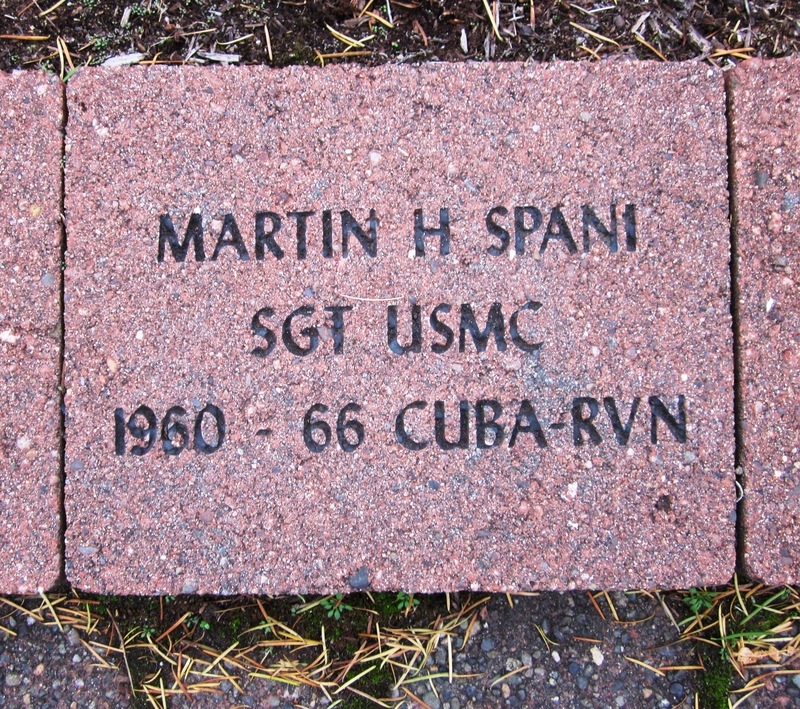 If you donate $30 to VFW Post 1040, you can have a 7″ x 9″ inscribed memorial brick installed in Veterans Memorial Park in downtown Lynnwood in honor of a veteran, living or deceased. Currently, 805 such bricks line the pathways and plantings in the park. See http://www.vfwpost1040.org/index.php. Newest Student from Lynnwood Attends School in Texas! Have you heard of the Marine Military Academy? Neither had I when I got an email from a parent in Lynnwood inquiring about private lessons for her son, a trumpeter, coming home from Texas for vacation during the Thanksgiving and Christmas holidays. At first, I wondered, does “marine” refer to the navy, merchant marine, oceanography, biology, or what? No, none of the above—it’s the U.S. Marine Corps, of course! We arranged four one-hour lessons while he’s home in November, and I now have my 13th student. The Marine Military Academy (MMA) is in Harlingen in south Texas, only about 11 miles from the Rio Grande River and the border with Mexico. Forty-five years ago in 1965, it was established as a private college preparatory school for boys, grades 8-12 (see www.mma-tx.org). It is the only Marine prep school in the USA, and the typical enrollment is about 350-400. My student is 17 and a senior. As a cadet at MMA, he plays in the school band. 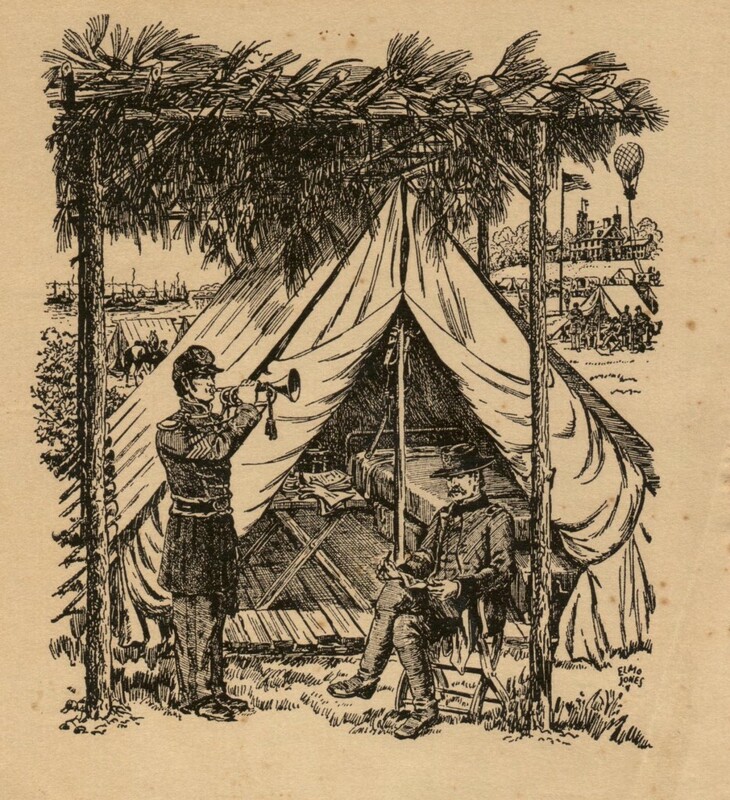 Three bugle calls get used regularly in the daily/weekly routine of school life: “Attention,” “Adjutant’s Call,” and “Taps.” For Pass in Review, the band plays the stirring march by John Philip Sousa known as “Semper Fi”—that’s short for Semper Fidelis (Latin, meaning “Always faithful”, the motto of the Marine Corps). And they play the moving “Marine Corps Hymn” (Halls of Montezuma), too, among many other pieces of music. For next year, he’s now considering three universities in Washington, Illinois, and Texas, and the Naval Academy in Maryland. His dream is to play trumpet in The United States Marine Band, known as “The President’s Own” (see www.marineband.usmc.mil/). God bless the Marines and all our military and all our veterans, way back to the Revolutionary War, 1776-1783. Freedom is not free. It’s a universal, human desire, and its costs, for every generation on this precious globe, are high. In these Thanksgiving holidays, I pray he lives his dream, God willing. 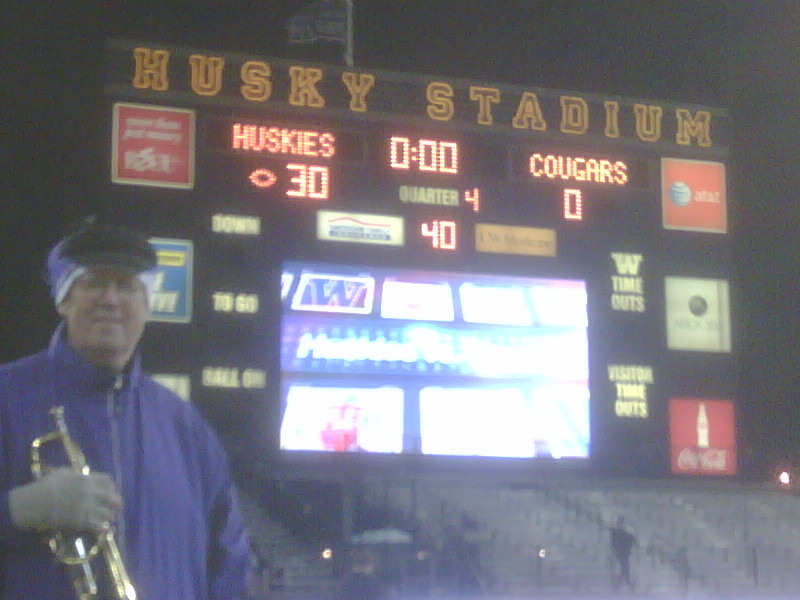 Huskies 30, Cougars 0–Alumni Band Helps Again! For the first time since 1968 (41 years! ), the Apple Cup ended in shutout–this time the Huskies held the Cougars scoreless. The headline on the Seattle Post-Intelligencer’s website on Sunday morning read, “Huskies Crush Cougs in Apple Cup Blowout.” This 102nd game between the two schools started at 3:30 p.m. and was played under lights as a cold wind blew wildly around the stadium. We were among the ~67,000 fans who were so grateful it did not rain. Chris Polk rushed for 130 yards and became the first true UW freshman ever to rush for over 1,000 yards in one season. Jake Locker had the kind of game everyone has expected of him every time he’s played these past three years, running for 94 yards, passing for 196, scoring one touchdown himself, passing for another. 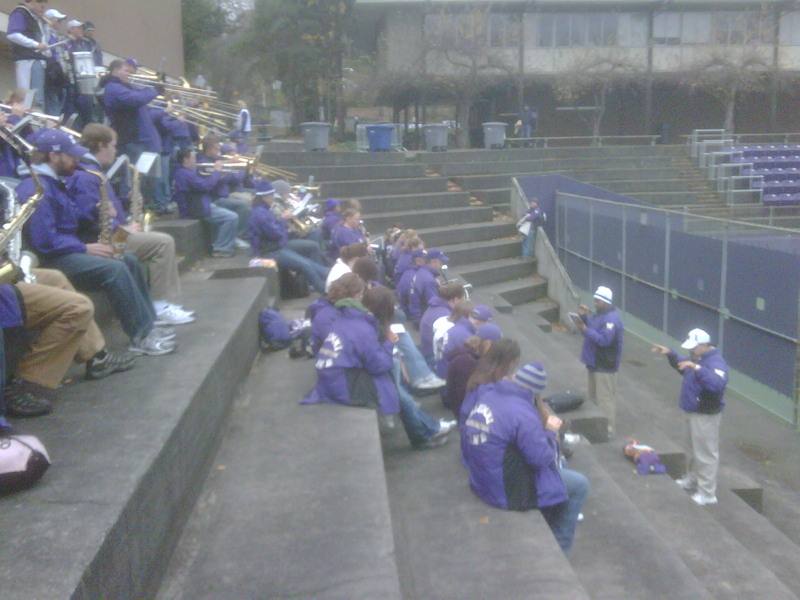 Once again, I attended for free as a member of the Husky Alumni Band (HMBAA). The band’s routine goes like this. We arrive three and half hours before kickoff and have a short rehearsal at the tennis court grandstand just north of Hec-Ed Pavillion. Then we walk to 4-5 tailgate venues in different parking lots. At each site we play about five tunes, ending up with a little longer session at the final stop near the Husky dog and Coach Jim Owens statues at the stadium entrance. In addition to the songs mentioned in my post (below) on 11 October, we played a bunch of other tunes yesterday, including “Shake a Tail Feather,” “Hey! Baby!”, “Vehicle,” “Find Myself a Sunny Spot,” “Polynesian Paralysis,” “Separate Ways,” and one of my favorites, “You Can Call Me Al.” Of course, we always play “Victory for Washington” and “Bow Down to Washington” everywhere–those two are givens. During the game itself, the routine continues. We play a few tunes during some of the time-outs. 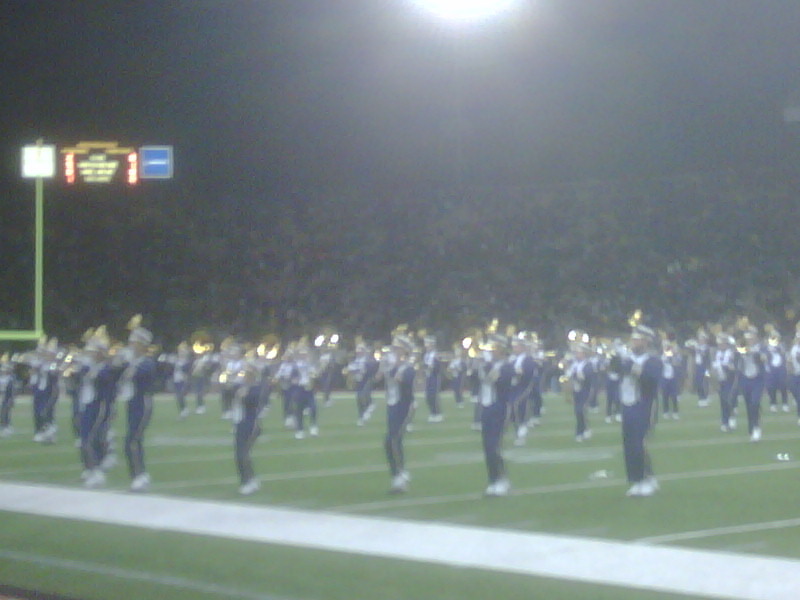 Our turn to play is all coordinated with the UW Varsity Band via headsets. Then, after the Varsity Band concludes its half-time show, we play a few tunes from the track in front of the main southside grandstand until the teams return and the second half begins. Next, after the game ends, we play a few tunes in front of the people in the “horseshoe” stands at the west end, where we always sit during the games. Our last song there last night was “Celebration.” People in the stands sang along and swayed to music…it’s great to relish a victory. Finally, we walk back to the Nordstrom Tennis Center behind Hec-ED, and play some more. I walked there with Dan Niven (see my post of 9 September below). Dan plays trombone, manages the Mills Music Store in Lynnwood, sings in the Total Experience Gospel Choir of the Mt. Zion Baptist Church in Seattle, and is an actor in various community theater groups. He’ll play the Ghost of Jacob Marley in the Evergreen Family Theatre’s production of Charles Dickens’ A Christmas Carol at the Redwood Family Church in Redmond in early December. We overheard a couple of very pleased fans talking about this victory and about beating the University of California Bears next Saturday. Dan noted that they spoke using the pronoun “we,” meaning the Husky football team. He observed that it’s funny how people own the team when it wins but disown it when it loses, switching to the pronoun, “they.” It’s “we did this and that” when our team is winning, and “they did this and that” when our team is losing…chuckle. How did the Alumni Band help “our” team win this historic game? Well, several times during the tailgate playing tour, we played our special version of the “WSU Fite Song.” We started out with the regular tune but suddenly broke into “Old McDonald Had a Farm.” Then we switched back to the regular fight song, only to interrupt it again with “The Farmer in the Dell,” immediately concluding with a most discordant, emphatic “Splat!” And that’s how WE really won the 102nd Apple Cup! Recently, I met the highly personable, enthusiastic Dan Niven, manager of the Mills Music Store in Lynnwood. Turns out that he plays trombone in the Husky Alumni Band at UW football games. It’s organized by the Husky Marching Band Alumni Association (HMBAA), www.hmbaa.org. 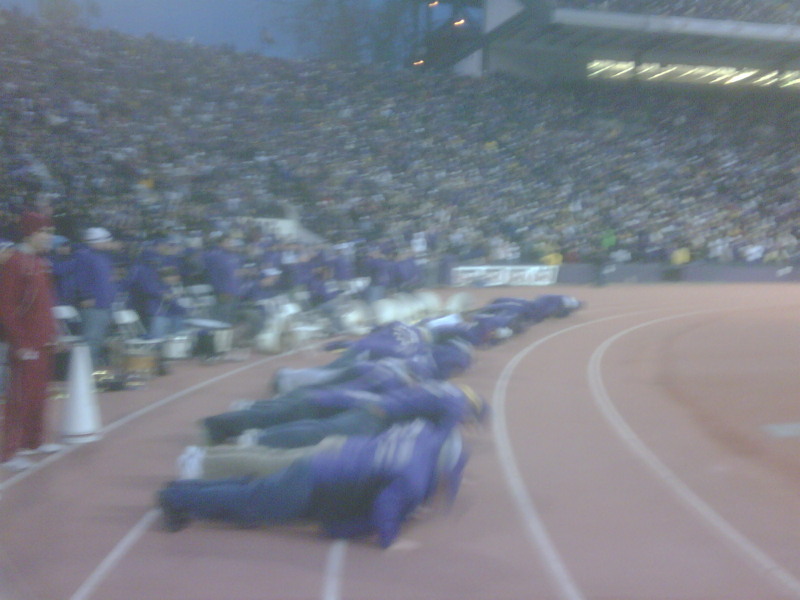 I’m a “Hum’-ba” member, too, and am looking forward to playing at the Arizona game at Husky Stadium on 10 October. “See you at the Horseshoe!” he says to me. At the store, there are studios where instructors teach private lessons. For those students who prefer it, we can meet there for our sessions. It is located at 20505 Highway 99 (east side of the road), telephone 425-775-6500. Great place to rent or buy your instrument, music books, supplies and accessories. It’s one of 11 Mills Music stores. Try them!